Director of the International Centre for Reindeer Husbandry and also a representative of the of the UArctic EALAT Institute Anders Oskal within the partnership with the Prince Albert II of Monaco Foundation, gave a presentation with regard to the current situation and the rapid changes in reindeer herding areas of the Arctic experienced by this region. The meeting was launched on 11th January at the Lycée Technique et Hôtelier of Monaco, in the presence of HSH the Sovereign Prince. During his presentation Anders shared a documentary called “The Keepers of the Land” with Prince Albert II of Monaco and with the audience which was mainly represented by the students from “Students On Ice” programme. On Friday and Saturday, November 5-6 in Kautokeino, a Memorandum of Understanding between the International Centre for Reindeer Husbandry and the Khuvsgul Khugjil Foundation, Mongolia was signed when members of the Mongolian Parliament visited ICR. The discussions centred around with the promotion of nomadism and local economies, students scholarships, film production, small business innovation, internet access, village friendship development and the language issue of the indigenous Dukha peoples in Mongolia. This cooperation is an outgrowth of the Nomadic Herders project. Some photos below. The visiting delegation included Battsteseg Batsuuri for the Mongolian Embassy in Stockholm, Batchuluun Otgonsur, an advisor from Ulan Bataar and Munkhbaatar Lkhagva, member of the Mongolian Parliament. Some more pictures here on our Facebook page. The Nomadic Herders project is this week in Nairobi, Kenya at the UNEP (UN Environment Programme) headquarters. Project leaders and partners are attending the UNEA (United Nations Environment Assembly (UNEA). UNEA is a result of the call made by world leaders at the United Nations Conference on Sustainable Development (Rio+20), held in Brazil in June 2012, to strengthen and upgrade UNEP as the leading global environmental authority that sets the global environmental agenda and by establishing universal membership in its Governing Council. ICR Director Anders Oskal and Nomadic Herders project leader Professor Svein Mathiesen are in attendance and have held a number of meetings with relevant personnel including UNEP Executive Director and Under-Secretary-General Achim Steinar of the United Nations to discuss the challenges of how international sanctions effect the implementation of GEF-UNEP projects. The team also met with Dr Marieta Sakalian, program manager of the Nomadic Herders project in UNEP. A new brochure has been released for the event (see below). You can follow UNEA on their Youtube channel here. Starting April 11th, 2016 in Kautokeino, Norway, this is a course organized by the Sámi University College and the UArctic EALÁT Institute in cooperation with the International Centre for Reindeer Husbandry. The course includes a two-week session in Kautokeino, and independent project-work to document traditional knowledge. International Centre for Reindeer Husbandry (ICR) in Kautokeino was opened by then the Minister of Local Governement and Regional Development, Mrs. Erna Solberg on September 2, 2005. The Government was also represented by the Minister of Children and Family Affairs, Mrs. Laila Dåvøy, State Secretary, Mrs. Ellen Inga O Hætta in the Ministery of Local Government and Regional Development, and State Secretary, Mr. Vidar Helgesen in the Ministry of Foreign Affairs in the opening ceremony in Kautokeino in 2005. The Centre contributes to the development of a new knowledge base for indigenous communities’ adaptation to the major changes in the Arctic. The Centre works with people-to-people cooperation and civil society from Alaska and Canada in the west to Mongolia and China in the east. Today, 10 years after its establishment, many reindeer herding youth from the northern areas attend in exchange programes organized by ICR. The Centre is now working with reindeer husbandry’s adaptation to climate changes and food culture in the Arctic Council. “… The establishment of ICR has significantly strengthened our opportunities for international people-to-people cooperation, exchange of information, recognition of our traditional knowledge, and the protection of indigenous communities in the circumpolar North,” said the General Secretary of WRH, Mr. Johan Mathis Turi. 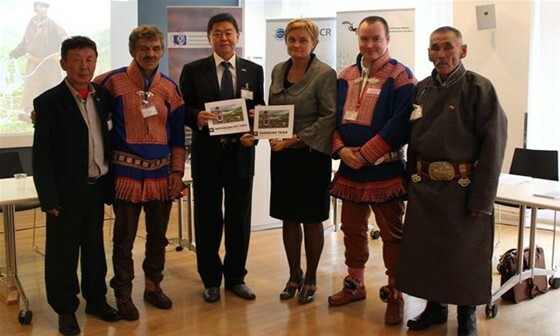 “… This is crucial for world reindeer herders, and thus the establishment of ICR is a great success”, he concludes. ICR will celebrate its 10th anniversary through a series of events in Norway and other reindeer herding countries during the period of 2 September 2015 to 2 September 2016. ICR is a contribution of the first white paper to the Norwegian Parliament in 2004/05. The Centre is organized as a governmental body with special powers, and receives today their basic funding from the state budget through the Ministry of Local Government and Moderination. The Centre is located in Kautokeino, Norway, with offices in Eastern Siberia, Russia and Canada. Dear organizers, guests and audience It is a pleasure for me, as the Minister for both the Sámi and the minorities, on behalf of the Norwegian Government, to open a new International Centre for Reindeer Husbandry, located in Kautokeino. This Centre will add a new dimension to the cooperation between both the Sami interests and us, and in the Arctic Council and the Barents Cooperation. The Government thinks it is of importance that the reindeer herders and their organizations have a close relationship to the Centre. We have therefore emphasized that the Centre is to be established and ran in cooperation with the Association of World Reindeer Herders. We have also been concerned to continue and strengthen the cross-border cooperation between reindeer herders. The Sámi reindeer husbandry was established long before we drew the borders between the state, and it is then essential to have a transnational cooperation in the years ahead. Reindeer herding organizations from both Russia, Finland, Sweden and Norway are thus represented in the board and they are thus invited to take part in developing and running the centre forward. The establishment of the Centre is a contribution from Norway to continue and strengthen the international cooperation between reindeer herders that was initiated for the first time 15 years ago by representatives from the reindeer husbandry. The cooperation includes today 20 different ethnic groups/nations who practice reindeer husbandry in large geographical areas in three continents and in totally 9 national states, from China and Mongolia in the east to Alaska and Canada in the west. The Centre will be a key hub for dissemination and exchange of information, experiences and knowledge between world reindeer herders, – and between reindeer herders and the outside world. We all need to learn more about reindeer husbandry in the Arctic and subarctic regions. I am glad that my participation today can be regarded as proof that the Centre already at the start have found their communication tools. It is nice for me to participate online and open the Centre in Kautokeino while I physically am located 2000 kilometres away. It is particularly pleasing to note that the Centre, representing a traditional industry, take active use of highly developed technology. New technology is not a strange element in the industry – just look at for example the binoculars, snowmobile and ATVs (all-terrain vehicles), which are here to stay in the work of reindeer husbandry. As known, reindeer herding, as a circumpolar industry residing in the marginal arctic regions, has developed a distinctive traditional knowledge and adaptation. In the practice of the industry, the herders have through the ages acquired experiences and valuable knowledge that make the basis of the operations of the industry in relation to the nature, the climate and the environment, animals and animal protection and harvesting and management of natural resources. Without adopting this peculiar traditional knowledge, it would be difficult, or impossible, for the herders to succeed in the industry, especially when taking into account the natural conditions in which the industry operates. Traditional knowledge is rarely recorded, but delivered orally from generation to generation. An important task for the Centre will be to document the traditional knowledge in the different regions. Too often, we experience that this type of traditional knowledge disappears from our society, because we have other ways to safeguard knowledge than what has been traditional. Equally important is that traditional knowledge is disseminated and made known between the different indigenous people. It is particularly crucial that the knowledge is accepted and used in educational systems, in research and, not at least, in public management. We have made little use of reindeer husbandry’s own experience and knowledge in our way to manage reindeer husbandry in Norway in the last 30 years. The aim must be that future generations recognize the value of indigenous peoples’ traditional knowledge as important skills for harvesting and management of the nature, the climate and the environment. The aim must also be to achieve a better and more appropriate management of indigenous livelihoods and areas in which the indigenous peoples live. With these words, I declare the International Centre for Reindeer Husbandry opened. I wish the board of the Centre, the reindeer herders and their organizations and other partners, good luck with the work ahead. Buorre lágideaddjit, guossit ja oasseváldit! Lea illun munnje, sihke sáme- ja minoritehtaministtarin, Norgga ráđđehusa bealis rahpat ođđa Riikkaidgaskasaš boazodoalloguovddáža Guovdageainnus. Dát guovddáš buktá ođđa dimenšuvnna ovttasbargui min ja sámi beroštumiid gaskka, Árktalaš Ráđis ja Barentsovttasbarggus. Ráđđehusa oainnu mielde lea dehálaš ahte boazoálbmogat ja daid searvvit dovdet lagas oktavuođa guovddážii. Mii leat danin deattuhan ahte guovddáš ásahuvvo ja jođihuvvo ovttas Máilmmi Boazoálbmogiid Servviin. Mis lea leamaš beroštupmi joatkit ja nannet boazodoalu rájáidrasttideaddji ovttasbarggu. Sámi boazodoallu álggahuvvui mihá ovdal go mii mearrideimmet riikkarájáid, ja dalle lea dehálaš ahte gávdno rájáidrasttideaddji ovttasbargu boahtteáiggis. Danin leat sihke Ruošša, Suoma, Ruoŧa ja Norgga boazodoalloservviin ovddasteaddjit guovddáža stivrras, ja searvvit leat dainna lágiin bovdejuvvon oasálastit guovddáža ovdánahttimis ja doaimmain ovddosguovlluid. Guovddáža ásaheapmi lea oassi Norgga áigumušain joatkkit ja nannet boazodoalu riikkaidgaskasaš ovttasbarggu, man ealáhusa ovddasteaddjit álggahedje 15 jagi dás ovdal. Ovttasbargu guoská dál 20 iešguđet čearddalaš álbmotjoavkkuide ja álbmogiidda, geat barget boazodoaluin viiddis geográfalaš guovlluin 3 máilmmiossodagain oktiibuot 9 stáhtain, Kinna ja Mongolia rájes nuortan gitta Alaskai ja Kanadai oarjin. Guovddáš galgá leat čanastatbáiki dieđuid, vásáhusaid ja máhtu juohkimis ja gaskkusteamis máilmmi boazoálbmogiid gaskka, ja boazodoalu ja máilmmi gaskka. Mii dárbbašat buohkat oahppat eambbo árktalaš ja subárktalaš boazodoalu birra. Mun lea ilus ahte mu oasálastin dál sáhttá leat duođaštussan dasa ahte guovddáš juo ásadettiin lea gávdnan iežas gulahallanneavvu. Lea somá munnje oasálastit interneahta bokte ja rahpat guovddáža Guovdageainnus vaikko ieš fysalaččat lean 200 miilla eret Guovdageainnus. Lea erenoamáš somá oažžut duođaštuvvot ahte guovddáš, mii ovddasta árbevirolaš ealáhusa, váldá atnui ođđa teknologiija. Ođđa teknologiija ii lea ođas ealáhussii, geahča mat ovdamearkka dihte giikana, skohtera ja bievlavuodjinfievrruid, maid ealáhus leat váldán atnui. Nugo diehtit lea boazodoallu, mii lea sirkumpolára ealáhus marginála árktalaš guovlluin, ovdánahttán iežas árbevirolaš máhtu ja heivehemiid. Ealáhusa doaimmaid oktavuođas leat boazoálbmogat áiggiid čađa čohkken vásáhusaid ja dehálaš máhtu, mii lea vuođđun ealáhusa doaibmavugiide luonddu, dálkkádaga ja birrasa dáfus, elliid ja elliidsuodjalus ja luondduriggodagaid ávkkástallama ja hálddašeami dáfus. Jos ii livččii ávkkástallama dán erenoamáš árbevirolaš máhtu, de livččii leamaš váttis dahje veadjemeahttun boazoálbmogiidda lihkostuvvat ealáhusain, erenoamážit go jurddašat makkár luonddubeales eavttuiguin ealáhus jođihuvvo. Árbevirolaš máhttu lea hárve čálalaččat vurkejuvvon, muhto sirddihuvvon njálmmálaččat buolvvas bulvii. Okta dehálaš bárgu guovddážis lea duođaštit árbevirolaš máhtu iešguđet guovllus. Beare dávjá vásihat mii ahte dákkár árbevirolaš máhttu jávká min servodagas danin go mii leat gávdnan eará vugiid mo vurket máhtu dál go dan mii lea leamaš árbevirolaš. Lihkka dehálaš lea ahte árbevirolaš máhttu juhkkojuvvo ja dahkko dovddusin álgoálbmogiid gaskka. Lea erenoamáš mearrideaddjin ahte máhttu dohkkehuvvo ja váldo atnui oahpahusvuogádagain, dutkamis ja erenoamážit almmolaš hálddašeamis. Mii leat beare unnán váldán atnui boazodoalu iežas vásáhusaid ja máhtu iežamet boazodoallohálddašeamis Norggas daid maŋimuš 30 jagis. Ulbmil berret leat ahte boahttevaš buolvvat oidnet ahte álgoálbmogiid árbevirolaš máhtu árvu lea dehálaš gealbun biebmoháhkamis luonddus ja luonddu, dálkkádaga ja birashálddašeamis. Ulbmil berre maid leat oažžut buoret ja riektáset hálddašeami álgoálbmotealáhusain ja dain guovlluin gos álgoálbmogat ásset. Dáigguin sániiguin raban Riikkaidgaskasaš boazodoalloguovddáža. Mun sávan guovddáža stivrrii, boazoálbmogiidda ja sin servviide ja eará bargoguimmiide lihkku bargguin ovddosguovlluid. The Centre contributes to the development of a new knowledge base for indigenous communities’ adaptation to the major changes in the Arctic. The Centre works with people-to-people cooperation and civil society from Alaska and Canada in the west to Mongolia and China in the east. Today, 10 years after its establishment, many reindeer herding youth from the northern areas attend in exchange programmes organized by ICR. The Centre is now working with reindeer husbandry’s adaptation to climate changes and food culture in the Arctic Council. “… The establishment of ICR has significantly strengthened our opportunities for international people-to-people cooperation, exchange of information, recognition of our traditional knowledge, and the protection of indigenous communities in the circumpolar North,” said the General Secretary of WRH, Mr. Johan Mathis Turi. “… This is crucial for world reindeer herders, and thus the establishment of ICR is a great success”, he concludes. Dear organizers, guests and audience! It is a pleasure for me, as the Minister for both the Sámi and the minorities, on behalf of the Norwegian Government, to open a new International Centre for Reindeer Husbandry, located in Kautokeino. This Centre will add a new dimension to the cooperation between both the Sami interests and us, and in the Arctic Council and the Barents Cooperation. Internasjonalt reindriftssenter (ICR) i Kautokeino ble åpnet av daværende Kommunal- og regionalminister Erna Solberg den 2. september 2005. Bilde: Åpningen av ICR 2 September 2005 i Kautokeino med minister Laila Dåvøy, statssekretær Vidar Helgesen, statssekretør Ellen Inga O Hetta, Victoria Tauli-Corpuz, mfl. Fra Regjeringen deltok også Barne- og familieminister Laila Dåvøy, statssekretær Ellen Inga O Hætta i KRD, samt statssekretær Vidar Helgesen i UD på åpningsarrangementet i Kautokeino. Senteret bidrar til utvikling av et nytt kunnskapsgrunnlag for urfolkssamfunnenes tilpasning til de store endringene i Arktis. Senteret arbeider med folk-til-folk samarbeid og sivile samfunn fra Alaska og Canada i vest til Mongolia og Kina i øst. I dag, 10 år etter etableringen, deltar mange reindriftsungdom fra nordområdene i utvekslingsprogram i regi av ICR. Senteret arbeider nå med reindriftens klimatilpasning og matkultur i Arktisk råd. ”…Etableringen av ICR har vesentlig styrket våre muligheter for internasjonalt folk-til-folk samarbeid, informasjonsutveksling, anerkjennelse av vår tradisjonelle kunnskap, og ivaretakelse av urfolkssamfunnene i det sirkumpolare nord”, sier Generalsekretær Johan Mathis Turi i Verdensforbundet for reindriftsfolk (WRH).”…Dette er avgjørende for verdens reindriftsfolk, og slik sett er etableringen av ICR en stor suksess”, konkluderer han. ICR vil markere sitt 10-årsjubileum gjennom en rekke arrangement i Norge og andre reindriftsland i perioden 2. september 2015 til 2. september 2016. ICR er et tiltak fra den første nordområdemeldingen til Stortinget i 2004/05. Senteret er organisert som et statlig forvaltningsorgan med særskilte fullmakter, og får i dag sin basisfinansiering fra statsbudsjettet via Kommunal- og Moderniseringsdepartementet. Senteret er lokalisert i Kautokeino, med underkontorer i Øst-Sibir, Russland og Canada. Kjære arrangører, gjester og forsamling! Det er en glede for meg, både som same- og minoritetsstasråd, på vegne av den norske regjeringen, å åpne et nytt internasjonalt fag- og formidlingssenter for reindriften som er lokalisert til Kautokeino. Dette senteret vil tilføre en ny dimensjon til samarbeidet, både mellom oss og samiske interesser, og i Arktisk Råd og Barentssamarbeidet. Etter Regjeringens syn er det viktig at reindriftsfolk og deres organisasjoner har et nært forhold til senteret. Vi har derfor lagt vekt på at senteret etableres og drives i samråd med Verdensforbundet for reindriftsfolk. Vi har også vært opptatt av å videreføre og styrke det grenseoverskridende reindriftssamarbeidet. Den samiske reindriften er etablert lenge før vi trakk grensene, og da er det viktig å også ha et grenseoverskridende samarbeid i årene fremover. Derfor er reindriftsorganisasjoner fra både Russland, Finland, Sverige og Norge representert i styret og de er på den måten invitert til å ta del i å utvikle og drive senteret fremover. Etableringen av senteret er et bidrag fra Norge til å videreføre og styrke det internasjonale reindriftssamarbeidet som ble initiert første gang for 15 år siden av næringens representanter. Samarbeidet omfatter i dag 20 ulike etniske folkegrupper/folkeslag som utøver reindrift i store geografiske områder i 3 verdensdeler og i til sammen 9 stater fra Kina og Mongolia i øst til Alaska og Canada i vest. Senteret skal være som et knutepunkt for formidling og utveksling av informasjon, erfaringer og kunnskap verdens reindriftsfolk i mellom, – og mellom reindriftsfolk og omverdenen. Vi trenger alle å lære mer om reindriften i hele den subarktiske og den arktiske del på den nordlige jordklode. Jeg er glad for at min deltakelse i dag kan framstå som et bevis på at senteret allerede ved oppstarten har funnet sitt kommunikasjonsverktøy. Det er hyggelig for meg å kunne delta på nett og åpne senteret i Kautokeino samtidig som jeg fysisk befinner meg 200 mil unna. Det er ekstra hyggelig å konstatere at senteret som representerer en tradisjonell næring, tar aktivt i bruk høytutviklet teknologi. Ny teknologi er ikke et fremmed element i næringen, se bare på for eksempel kikkerten, snøscooteren og barmarkskjøretøyer, som er kommet for å bli i næringsutøvelsen. Som kjent, har reindriften, som en sirkumpolar næring med tilhold i marginale arktiske områder, utviklet en særegne tradisjonelle kunnskaper og tilpasning. Ved utøvelsen av næringen, har reindriftsfolk gjennom tidene tilegnet seg erfaringer og verdifulle kunnskaper som er lagt til grunn i næringens driftsformer i forholdet til naturen, klimaet og miljøet, dyr og dyrevern og høsting og forvaltning av naturressursene. Uten å ta i bruk denne særegne tradisjonskunnskapen, ville det vært vanskelig, eller umulig, for reindriftsfolk å lykkes med næringen, særlig når vi tar i betraktning de naturgitte betingelser som næringen drives under. Tradisjonskunnskap er sjelden nedtegnet, men overleveres muntlig fra generasjon til generasjon. En viktig oppgave for senteret, vil bli å dokumentere de tradisjonelle kunnskapene i ulike regionene. Altfor ofte opplever vi at den typen av tradisjonell kunnskapen forsvinner fra vårt samfunn, fordi vi har andre måter å ivareta kunnskapen enn det som har vært det tradisjonelle. Like viktig er det at tradisjonskunnskapen spres og gjøres kjent urfolk i mellom. Det er særlig avgjørende at kunnskapen blir akseptert og tatt i bruk i utdanningssystemer, i forskningen og ikke minst i den offentlige forvaltningen. Vi har tatt lite i bruk reindriftens egne erfaring og kunnskaper i måten vi har forvaltet reindriften på i Norge i de siste 30 årene. Målsettingen må være at fremtidige generasjoner ser verdien i urfolks tradisjonskunnskaper som viktig kompetanse for høsting og forvaltning av naturen, klimaet og miljøet. Målsettingen må også være å få til en bedre og mer riktig forvaltning av urfolksnæringer og av de områder urfolk bebor. Med disse ord erklærer jeg det internasjonale fag- og formidlingssenteret for reindriften for åpnet. Jeg ønsker senterets styre, reindriftsfolk med deres organisasjoner og andre samarbeidspartnere til lykke med arbeidet fremover. June 18, Ulan-Ude, Russia. The Buryat State University hosted an international round table devoted to preservation and development of taiga reindeer husbandry. The seminar was organized by the Association of World Reindeer Herders (WRH) together with the Association of Northern Indigenous Peoples of Republic Buryatia and UArcitc EALAT Institute under the International Centre for Reindeer Husbandry (Norway). At a previous UNEP Council meeting, ICR Director Anders Oskal met with CEO and Chair of the Global Environment Facility (GEF), Dr. Naoko Ishii (here in the middle of the picture below). Oskal is also pictured with Tulga Buya, who was then Vice-Minister of Environment and Green Development Mongolia. Here they discussed the Nomadic Herders project. Mr Tulga Buya, Dr. Naoko Ishii, CEO and Chair of the Global Environment Facility (GEF) and Anders Oskal. The Arctic is changing twice as fast in terms of warming as the rest of the world. What happens to migratory species in the Arctic will affect what happens in the overwintering grounds of those species, and what happens to the melting glaciers and permafrost thaw will affect sea level rise in the rest of the world. This book is also available for download with iBooks on your Mac or iPad, and with iTunes on your computer. Multi-touch books can be read with iBooks on your Mac or iPad. Books with interactive features may work best on an iPad. iBooks on your Mac requires OS X 10.9 or later. Check it out here. The International Centre for Reindeer Husbandry video ‘Keepers of the Land’ video is featured in this ebook. April, 17-18. Business forum was held in Neryungri, south of the Republic of Sakha (Yakutia). The main purpose of the event was to create a unique platform for attracting investments into economy of Southern Yakutia. The business forum was organized by the local administration and the government of the Sakha Republic, supported by the Chamber of Commerce and Industry of the Sakha Republic. The Norwegian State Broadcasting company (NRK) covered the launch of the IPCC 5th Assessment event in Kautokeino with an article and short video featuring ICR Director Anders Oskal, and Bob Corell, ACIA leader author and long time collaborator with ICR. The article is in Norwegian and Sami. The Intergovernmental Panel on Climate Change (IPCC) released a report today that says the effects of climate change are already occurring on all continents and across the oceans. The world, in many cases, is ill-prepared for risks from a changing climate. The report also concludes that there are opportunities to respond to such risks, though the risks will be difficult to manage with high levels of warming. The Fifth Assessment Report (AR5) will provide a clear view of the current state of scientific knowledge relevant to climate change. It will comprise three Working Group (WG) reports and a Synthesis Report (SYR). The outline and content can be found in theAR5 reference document and SYR Scoping document. IPCC has been endeavouring to engage smaller communities in their work and its dissemination and as a result are holding a launch event for the IPCC 5th Assessment, Working Group II, Polar Regions Chapter in Kautokeino, organized by ICR which runs today, March 31, 2014. The event runs all day and wraps with a visit to a herders camp. Download the programme here. ICR has just released a short film by Philip Burgess entitled ‘Keepers of the Land – Reindeer Herding, Biodiversity and Knowledge in the Arctic‘. The film is just over 9 minutes long and gives a short overview of reindeer husbandry across the Arctic and sub Arctic. The film is an outcome from the Nomadic Herders and EALLIN projects and introduces these projects and their goals and features interviews with Mikhail Pogodaev (Executive Chair of WRH) and Elena Walkeapaa a student, reindeer herder and participant / organiser of EALLIN. A key theme of this short film is the contribution that reindeer herders can make towards preserving biodiversity in the Arctic and that herders are supporters of protected areas in their herding lands as long as they can be active participants in the planning and implementation of such areas. Ulaan Bataar, Mongolia – 3 June 2013 – During the World Environment Day celebrations – hosted this year by the Government of Mongolia – the Nomadic Herders’ project held a seminar/workshop on Monday 3rd June entitled “The Future for Reindeer Husbandry and Conservation in Mongolia’s Biodiversity Hotspot”. The seminar gathered together reindeer herders from East and West Taiga, the Ulaan Taiga Protected Areas Administration, the Hovsgul Aimag regional government, as well as representatives from the Ministry of Environment and Green Development, the Association of World Reindeer Herders (WRH), the International Centre for Reindeer Husbandry (ICR) and GRID-Arendal. The focus of the seminar was to provide an update and information sharing session on the topics of the new Special Presidential Decree on Reindeer Husbandry; a new potential project to transport reindeer from Sakha Republic to Mongolia; recent developments in the establishment of the Tengis-Shishged Protected Area; and a presentation on the Nomadic Herders UNEP/GEF project. Opening the session, Tsogtsaikhan Purev from the Ministry of Environment and Green presented the new Special Decree on Reindeer Husbandry. The Decree, which was recently enacted by Parliament, will have a focus on providing increased access for the reindeer herding community to social welfare, education, and cooperation opportunities. A total of 36 activities under four pillars will be implemented over 5 years. The Nomadic Herders Project is in Ulan Bator, Mongolia this week as invited guests of Mongolia’s hosting of UNEP’s World Environment Day events this week. Today, the team met with the President of Mongolia Tsakhiagiin Elbegdorj. The President has taken an active interest in the Nomadic Herders project, not only visiting herders in Tsaaggaanuur to hear first hand of the challenges they are facing (Dukha/Tsataan herders are among the world’s most vulnerable reindeer herding peoples) but also in passing legislation (in 2007) and implementing this year, beginning June 1, that reindeer herders children under the age of 18 will receive money equivalent to 50 percent of the minimum cost of living in the Khangai region, while adults will receive the full sum each month (read this full story here on the Nomadic Herders site). This is the second time that the Nomadic Herders team have met with the President, the first being in October 2012 when a Mongolian delegation led by the President visited Oslo, Norway (see story here and here). As part of UNEP World Environment Day which is being hosted by Mongolia, the Nomadic Herders project is holding a multistakeholder workshop in Ulan Bator on June 3. The seminar is entitled The future of reindeer husbandry in Mongolia and Conservation in Mongolia’s Biodiversity hotspot. This year the main UNEP World Environment Day event is hosted by the government and people of Mongolia, and focuses on the new UNEP and UN Food and Agricultural Organization (FAO) campaign Think.Eat.Save. Reduce Your Foodprint, which is aimed at slashing food waste. Mongolia is one of the fastest-growing countries in the world, and is aiming to ensure this growth goes hand in hand with a green economy and civilization. While Mongolia does not waste significant food, the traditional nomadic lifestyle of some of its people—who developed ways to preserve food for long periods—offers some ancient answers to the modern-day challenge of food waste. Mongolia is prioritizing a Green Economy shift across its big economic sectors such as mining and promoting environmental awareness among youth. As part of these events in Ulan Bator, the Nomadic Herders project is hosting a seminar on Monday June 3, entitled ‘The Future for Reindeer Husbandry and Conservation in Mongolia’s Biodiversity Hotspot’ which will be attended by reindeer herders from Tsagaannuur, researchers, local and regional administration figures and Dukha youth living in Ulan Bator. The President of Mongolia, Ts.Elbegdorj, passed an order in 2007 to improve the living conditions, livelihoods and herding of the “Reindeer People”. Also known as the Tsaatan, they are herders who primarily raise reindeer in the north. Accordingly, on its last meeting on May 11, the government approved a new decree which will conduct several more measures to advance the implementation of the 2007 directives. In accordance with the decree, a plan to intensify the implementation of “Recovering the reindeer herding and improving the reindeer herder’s livelihood” program, and a National Council to manage the program nationwide were newly formed. The council will make an annual report of its performance and results in December to both the President of Mongolia and the public. According to UNESCO, The Measles & Rubella Initiative, a global partnership to end these diseases, has helped reduce measles deaths by 71 per cent since 2001. An October 2012 immunization campaign against measles and rubella in Mongolia reached over 95 per cent of targeted children. A specific effort was made to reach the 24% of children in Mongolia that are born into nomadic familes, such as the reindeer herding families in the Khövsgöl’s remote district of Tsaganuur. The Nomadic Herders’ team has just returned from a successful field visit to the reindeer herding community of northern Mongolia, to discuss the proposed GEF project and gather feedback and information from the community. Mongolia’s only reindeer herders, the Dukha, are located in Tsaganuur sum (district) in the Hovsgul aimag (region) of northern Mongolia. Following a short visit to the Hovsgul Lake Winter Ice Festival, the team travelled to the administrative centre of Tsaganuur for meetings with the community and administration officials. A seminar was organized in the sum centre where about 60 members of the reindeer herding community were present, giving an opportunity for the team to present the ideas and concepts of the project, and to listen to advice and feedback from the community about the most pressing issues facing reindeer husbandry today in Mongolia. At the UNEP Governing Council Session in Nairobi, 18-22 December, it was announced that Mongolia had been selected as host country for the World Environment Day! Today the Nomadic Herders’ team has been in discussions with the Ministry of Environment and Development, who are keen to showcase the Nomadic Herders project and raise awareness of the issues of reindeer herding and sustainable pastoralism in Mongolia. (From the UNEP Press Release) Nairobi, February 22 2013 – Mongolia, which is prioritizing a Green Economy shift across its big economic sectors such as mining and promoting environmental awareness among youth, is to host this year’s World Environment Day (WED) celebrations on June 5, the UN Environment Programme (UNEP) announced today. The 2013 theme for the event, the single biggest day for positive action on the environment worldwide, is Think.Eat.Save. Reduce Your Foodprint – building on the global campaign of the same name to reduce food waste and loss launched earlier this year by UNEP, the Food and Agriculture Organization (FAO) and partners. Svein Mathiesen and Bjorn Alfthan have headed south from Yakutsk and Yakutia over the past weekend in order to continue building the GEF project proposal in Mongolia, one of the two countries involved, with Russia, in the Nomadic Herders GEF project. After 30 hours on the Trans-Siberian train from Irkutsk to Ulaan Bataar, they met up in sunny (and comparatively warm) Ulaan Bataar with the local coordinating team for Nomadic Herders, Solongo Tsegevmid and Tsogtsaikhan Purev, in order to make consult with the relevant Ministries in Ulaan Bataar, and to visit Tsaganuur and the surrounding taiga to consult with the Dukha reindeer herders in this project. Following on from a preparatory visit by Mikhael Pogodaev and Anna Degteva in late December 2012, the Nomadic Herders’ team has been working hard last week to consult with the various Ministries of the Government of Sakha (Yakutia), during the CAFF Biennial meetings held 11 – 15 February 2013. We also had the chance to meet with various experts on land degradation and biodiversity conservation within the North-East Federal University. We have made excellent progress in linking and consulting with the various Ministries. On Tuesday 12th February, the team met with Vice-Minister within the Ministry of Federative Affairs and External Relations, at which she expressed enthusiasm for the first cooperation between UNEP (via the Global Environment Facility) and the Government of Sakha (Yakutia). What a week it has been for the Nomadic Herders’ team! Part of our team – that is, Mikhail Pogodaev (Association of World Reindeer Herders), Svein Mathiesen and Anna Degteva (International Centre for Reindeer Husbandry) and Bjorn Alfthan (GRID-Arendal) – have been participating at the Conservation of Arctic Flora and Fauna (CAFF) Biennial Meeting, held last week in Yakutsk, Sakha Republic. The CAFF working group coordinates the Arctic Council’s international cooperation on biodiversity conservation across the Arctic. This Biennial Meeting, held between 11 – 15 February, marked the culmination of the Russian Chairmanship of CAFF, under Dr. Evgeny Syroechkovskiy, who also works closely with the Nomadic Herders team. Nomadic Herders – Follow us on Facebook! You can now follow the progress of the Nomadic Herders project on Facebook. Like our Facebook page and keep up to date! Over four intense but productive days, the Nomadic Herders project team gathered in St. Petersburg to plan, discus and gather feedback from various experts (scientists, reindeer herders, government officials) from the candidate target areas of the UNEP/GEF Nomadic Herders project. Over the first two days, the main project partners, including the Focal Point within the Ministry of Natural Resources and Environment of the Russian Federation (Mr. Evgeny Syroechkovskiy), discussed project developments and the development of concrete activities for the target regions in Mongolia, and in Sakha Republic (Yakutia) and Chukotka. The Nomadic Herders project also conducted a half-day expert consultation meeting with much wider participation, which included scientists, reindeer herders from the project regions, local and regional government officials, and others, from Mongolia, Sakha Republic and Chukotka. The session was very useful to gather feedback from the regions themselves about the situation on the ground; they also helped identify potential model areas and the priority activities for each region. In Oslo recently there was a landmark meeting between nomadic peoples. The President of Mongolia was in Oslo accompanied by a large delegation that included several reindeer herders. The President and delegation had a number of meetings in the city, including with the Ministry of Foreign Affairs, the Norwegian Chamber of Commerce and with the team from the International Centre for Reindeer Husbandry and the Association of World Reindeer Herders. The International Centre for Reindeer Husbandry had good reason to meet with the delegation as ICR is a key partner in an innovative project entitled Nomadic Herders which was born in 2010 and is a joint initiative by UNEP/GRID-Arendal, the Association of World Reindeer Herders and the UArctic EALAT Institute at the International Centre for Reindeer Husbandry. The project is also part of the United Nation Environment Programme’s (UNEP) work on Ecosystem-based Adaptation and funded by the Norwegian Ministry of Foreign Affairs. The project builds on the results and experiences from the International Polar Year EALAT project on climate change adaptation in reindeer husbandry. On 8 October, the Nomadic Herders’ project (www.nomadicherders.org) launched the Mongolian edition of the 2012 UNEP “Changing Taiga: Challenges to Mongolia’s Reindeer Herders” report, which highlights some of the main environmental issues and challenges facing the countries’ last remaining reindeer herders. The report was presented to Tsakhiagiin Elbegdorj, President of Mongolia, by Mrs. Mrs.Rigmor Aasrud, Minister of Government Administration, Reform and Church Affairs of Norway, at a seminar on the future of reindeer husbandry held in conjunction with the Mongolia – Norway Business Forum at the Grand Hotel, Oslo. The Report is launched in the presence of Mrs. Rigmor Aasrud, Minister of Government Administration, Reform and Church Affairs. Photo taken by Kathrine Johnsen. 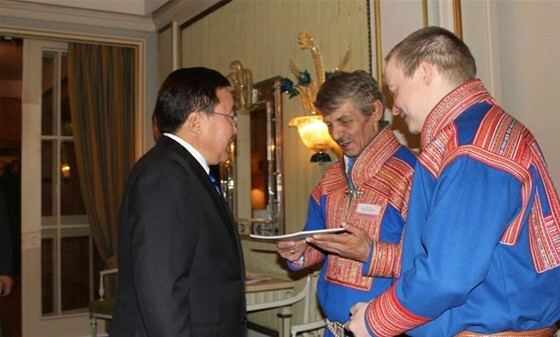 On occasion of the Mongolian State visit to Norway, 7-9 October 2012, the Nomadic Herders project team was able to meet with the highest levels of Mongolian government, including the President, His Excellency Mr. Tsakhiagiin Elbegdorj. The Mongolian-language version of the United Nations Environment Programme (UNEP) report, entitled Changing Taiga: Challenges to Mongolia’s Reindeer Herders was presented to the President, and shared with the Mongolian delegates at the Business Forum. The report presents recommendations from the Dukha reindeer herding families themselves to improve the sustainability of reindeer herding and the management of their pastures and homeland. Anders Oskal (International Centre for Reindeer Husbandry), and Johan Mathis Turi (Association of World Reindeer Herders) were subsequently invited for a breakfast meeting with the Mongolian Minister of Foreign Affairs and Trade, Mr. Gombojav Zandanshatar, during which the Nomadic Herders project was discussed. During the Mongolian State Visit, Nomadic Herders facilitated a Seminar, entitled “The Future of Reindeer Husbandry between Mongolia and Norway” which explored issues of common concern and also opportunities between reindeer herders of Mongolia and Norway. Partners in the United Nations Environment Programme (UNEP)/Global Environment Facility (GEF) Nomadic Herders project met in Kautokeino at the offices of the International Centre for Reindeer Husbandry (ICR), in the heart of Sami reindeer herding. The meeting provided a first opportunity to start developing the proposal to be submitted to the Global Environment Facility. The project pre-proposal of the UNEP/GEF Project, entitled Nomadic Herders: Enhancing the Resilience of Pastoral Ecosystems and Livelihoods of Nomadic Herders was approved just before the summer, paving the way for work to being on developing a full project. Representatives from UNEP (Edoardo Zandri), GRID-Arendal (Bjorn Alfthan, Uli Pliest), ICR (Svein Mathiesen), from the Russian project team (Anna Degteva) and from the Mongolian project team (Solongo Tsegevmid) were present. Oslo, 8-9 October 2012 – This coming week, reindeer herders from Norway and Mongolia will meet to discuss common challenges, opportunities and prospects for future cooperation, on the occasion of the Mongolian Presidential visit to Norway. The Norwegian Minister of Reform, Government Administration and Church Affairs, Mrs. Rigmor Aasrud, will open the Seminar “Future Cooperation between Reindeer Herding in Mongolia and Norway” on Monday 8 October. The seminar will include representatives from the Dukha reindeer herding people in Mongolia, the International Centre for Reindeer Husbandry, the Association of World Reindeer Herders, the United Nations Environment Programme – GRID/Arendal, and from several Ministries in Norway and Mongolia meeting to discuss future cooperation on issues of common concern connected to the Nomadic Herders’ Initiative. The Nomadic Herders project was presented during the 11th Session of the United Nations Permanent Forum on Indigenous Issues in May 2012 in New York, and described as an example of a joint effort of a UN agency and indigenous peoples to increase the resilience of traditional livelihoods, as well as pastoral ecosystems in the region. The Permanent Forum on Indigenous Issues meets every year at the UN headquarters. The Forum is an advisory body to the Economic and Social Council with a mandate to discuss indigenous issues related to economic and social development, culture, the environment, education, health and human rights. Ms. Gombo Dalaijargal met HRH Prince Albert II of Monaco and presented concerns of her reindeer herder community. The report, Changing Taiga: Challenges to Mongolian Reindeer Husbandry, was officially launched during a special Ice Cinema event held 26 March in Kautokeino, the heart of reindeer husbandry in northern Norway. The launch was attended by HRH Prince Albert II of Monaco and Princess Charlene; participants of the Future Arctic Leaders Training Course – a course for youth from reindeer herding communities in Fennoscandia, Russia and Mongolia; as well as participants of the World Indigenous Television Broadcasting Conference taking place in Kautokeino at the same time. The Mongolian student that took part of the Future Arctic Leaders Training Course, Ms. Gombo Dalaijargal, presented concerns of her community to HRH Prince Albert II of Monaco and Princess Charlene during a private dialogue between the students and the royal couple. Based on the field investigations, interviews and workshop discussions, the Nomadic Herders produced the publication, Changing Taiga: Challenges to Mongolian Reindeer Husbandry, to be launched on the 26th March 2012. This UNEP publication addresses the current state of reindeer husbandry in the taiga region of northern Mongolia and presents recommendations from the Dukha reindeer herding families themselves to improve the sustainability of reindeer herding and the management of their pastures and homeland. The publication addresses also a request from the Ministry of Nature, Environment and Tourism to assess the situation of the Mongolian reindeer herders. The report will be launched in Kautokeino, northern Norway, on the 26th March 2012 during a visit by HRH Prince Albert II of Monaco. The World Indigenous Television Broadcasting Conference also takes place during this time (25-29 March). During its meeting 28th February – 1st March 2012, the Board of the Arctic Council working group on Conservation of Arctic Flora and Fauna (CAFF) fully endorsed the Nomadic Herders as an Arctic Council project. The Nomadic Herders also forms part of the Arctic Council Sustainable Development Working Group project Reindeer Herding Youth. The Nomadic Herders project is featured in the Framework Convention on Climate Change (UNFCCC) Ecosystem-Based Adaptation Calendar 2012 (see cover and December pages) and provides one of the cases in the UNFCCC’s compilation of Ecosystem-based approaches to adaptation: Compilation of information. Mongolia, Russia and Fennoscandia, scientists, and local and national authorities. The purpose of the workshop and a subsequent field trip to two of the herders’ camps was to discuss herders’ and other stakeholders’ concerns related to biodiversity, land use, resource extraction, and climate change – all of which are representing challenges for sustainable land management and reindeer husbandry in the Mongolian taiga. Information and recommendations for how to deal with these challenges gained in Tsagaannuur, as well as during the workshops in Ulan Bator 2010 and New York May 2011, provided input for a report on reindeer husbandry in Mongolia, Changing Taiga: Challenges for Mongolia’s Reindeer Herders. The report, which includes recommendations targeting herders, scientists and policy-makers, met a direct request from the Mongolian Ministry of Nature, Environment and Tourism (MNET) to assess the situation of the country’s only reindeer herders. The UNEP Nomadic Herders initiative was welcomed by the UN Permanent Forum on Indigenous Issues (UNPFII) at their 9th Session (2010), and hosted a side-event at the 10th Session in 2011entitled Nomadic Herders’ Adaptation to Globalization: The Case of Reindeer Husbandry. The Nomadic Herders initiative was presented and discussed at the side-event, which also presented cases from Russia, Mongolia, Sweden and Norway. The side-event built on the Special Rapporteur report of Lars-Anders Baer, former member of the Permanent Forum, on reindeer husbandry and climate change. Nomadic Herders has provided content to a Special Rapporteur report of Anna Naykanchina, member of the Permanent Forum, on the loss of rangeland traditionally used by reindeer herding communities which will presented to the 11th Session of the UNPFII in New York in May 2012. On Wednesday, May 18th, the EALAT team, ICR and WRH will in collaboration with UNEP will host a side event to the 10th session of the UN Permanent Forum on Indigenous Issues in New York. The event will focus on the issues of adaptation of nomadic herders to globalisation and will highlight the cooperation between UNEP, WRH and ICR on this issue in Mongolia. Read the press release and download the poster and more information below. Nomadic pastoralism provides a highly efficient way of managing sparse vegetation. Pastoralists adapt their social and herding systems according to seasonal or spatial weather conditions and the availability of fertile pastures. Biological diversity is enhanced and ecosystem integrity and resilience is maintained. In other words, pastoralism is vital for conserving large areas of natural and semi-natural habitats, and the abandonment of pastoralism threatens biodiversity. However, Indigenous pastoral livelihoods are increasingly stressed by land use change and loss of biodiversity due to increased infrastructure development, resource exploitation and other forms of human activities that create barriers to livestock mobility. The focus of this side-event will be on land use changes of grazing land traditionally used by Indigenous reindeer herders. There will be presentations of cases from Russia, Mongolia, Sweden and Norway. See next page for the side-event programme. The side-event builds on the Special Rapporteur report of Lars-Anders Baer on reindeer husbandry presented at the 9th Session, the results of the International Polar Year/ Arctic Council EALAT project, as well as the UNEP Nomadic Herders project recognized by the 9th Session. The EALAT Arctic Council report and video will be distributed at the event. The event will be held Wednesday 18th May 1:15-2:45 pm, in the UNESCO Conference Room in the UN DC2 building – on East 44th Street near 1st Avenue, across the street from UN Headquarters and directly across from UNICEF Headquarters on East 44th Street. UNESCO is on the 9th floor. In December 2010, the Nomadic Herders initiative held a workshop in Ulan Bator hosted by the Ministry of Nature, Environment and Tourism. Herders, scientists, and local and national authorities participated and discussed issues of concern related to biodiversity, land use, resource extraction, and climate change – all of which are representing challenges for sustainable land management and reindeer husbandry in the Mongolian taiga. The workshop identified threats to and potentials for enhancing the resilience of herder communities and taiga ecosystems in Mongolia.